Kenneth Pinto | NUS Toddycats! 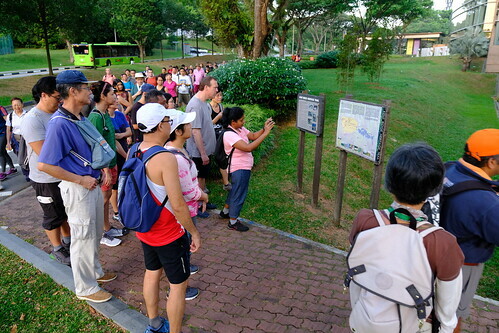 Sat 9th Feb 2019 – some 70 members of the public with a special passion for heritage gathered before dawn to commemorate the Battle of Pasir Panjang. Fought through the ridge 77 years ago, it would be the last two days before Singapore fell on 15th Feb 2019. We traced the steps of the Malay Regiment as they held off the Imperial Japanese Army, and then were forced into a desperate and retreating battle. We began, as they did, at the junction of Ayer Rajah Road and Reformatory Road – what is today Ayer Rajah Expressway and Clementi Road. 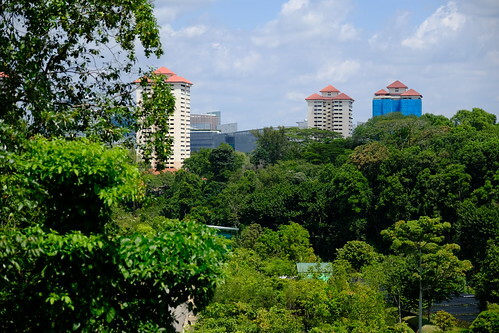 After the 7.00am briefing amidst a grove of Gelam trees next to the NUS University Cultural Centre, we made our way up the ridge, onto Kent Ridge Road, past The Gap into Kent Ridge Park and finally Bukit Chandu. Along the way, we shared stories of the battle, interweaved with the history, geography and biology of the ridge. 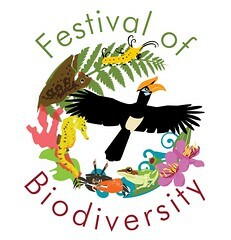 This year – also the 200th anniversary of modern Singapore’s founding – the recurring theme was a biologist view of human behaviour: from expanding civilisations to colonialism, World War 2 and beyond: the exploitation and manipulation of humanity by a minority of their own kind. 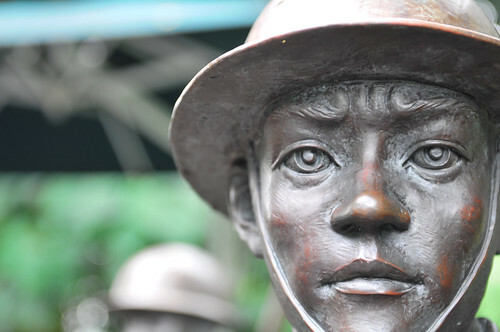 But importantly, we took heart by remembering these men who had been banded together, who faced impossible odds, fought on these grounds beyond the call of king or country, neither for creed nor ethnicity but simply for each other. Cultural Centre, where the Battle of Pasir Panjang began. and provide highlights about historical points along the way. 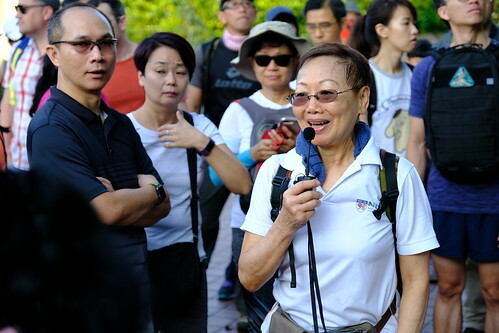 Veteran guide, Oi Yee, who walked the ridge in the 1950’s, shares tales about the botany and uses of Simpoh Air and Resam from kampung days. Following the guides up to point 270 on the maintenance trail. of the ridge after the Duchess of Kent in 1954, during the Emergency. the last stand of Lt Adnan bin Saidi and his men of The Malay Regiment. Ever changing landscape: The point blocks at Normanton Park, where the Normanton Oil Depot was located. This will be lost to redevelopment soon. 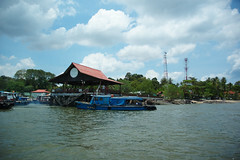 For more about the heritage of Pasir Panjang, see the webpage and blog. Saturday 14 February, Valentine’s Day & Chinese New Year Eve. Sunday 15 February, Chinese New Year. Those festive occasions were probably far from most people’s minds as Singapore was on the brink of surrender. They were most likely the least of the Malay Regiment’s concerns as they fought to hold Pasir Panjang Ridge – the present Kent Ridge. 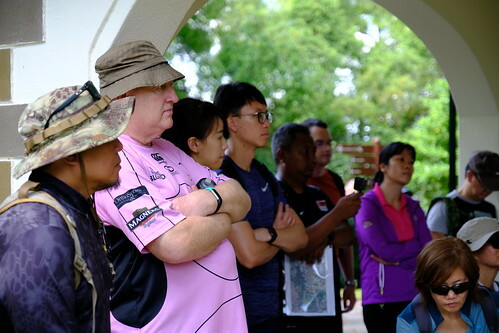 So, the Pasir Panjang Guides gathered with a 50-strong group of diverse participants to commemorate the battle on 14 Feb – incidentally a Saturday this year. 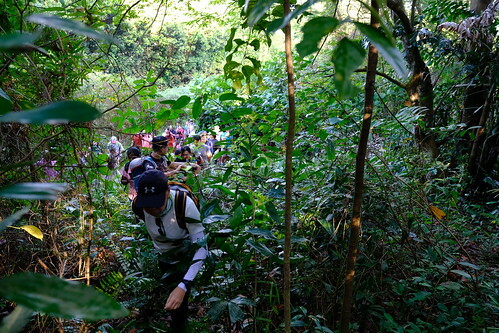 Battle of Pasir Panjang Commemorative Walk 2009 – Registration open! 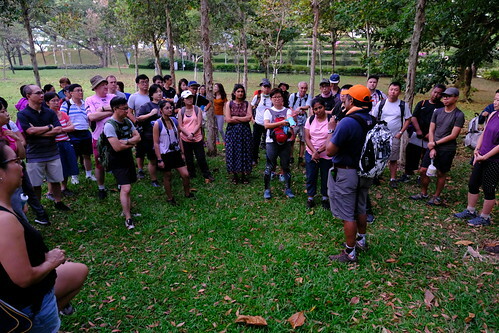 The Toddycats’ first guided walk of the year is the Battle of Pasir Panjang Commemorative Walk. The Pasir Panjang guides met last weekend to tie down details of our activities this year, as well as planning for the upcoming walk. 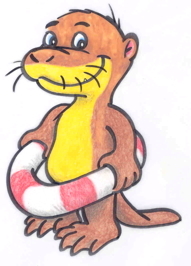 Oh, event details on Facebook too! Two groups of about 40 participants each took part in the third annual M.I.A. Trail. This walk is conducted as part of International Museum Day 2008 celebrations. The Pasir Panjang Heritage Guides met the participants at Harbourfront Cruise Centre’s bus bay. First stop: Raffles Museum of Biodiversity Research at NUS, where we introduced Singapore’s flora and fauna as well as the many species and habitats that have gone missing or are close to being wiped out. Reflections at Bukit Chandu, which is at the end of Kent Ridge Park’s canopy walk. Participants found out about the history of the Malay Regiment and the background about the Japanese invasion of Malaya. This led up to the Battle for Singapore and the Battle of Pasir Panjang, where the Malay Regiment had their final stand. That was also the last stop of the MIA Trail. 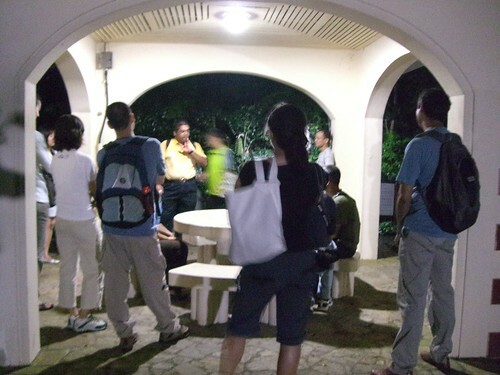 It’s always a unique experience for guides and participants alike as this tour takes place at night. If you missed us this time around, we will be conducting more walks (daytime) when Heritage Fest is on in July. 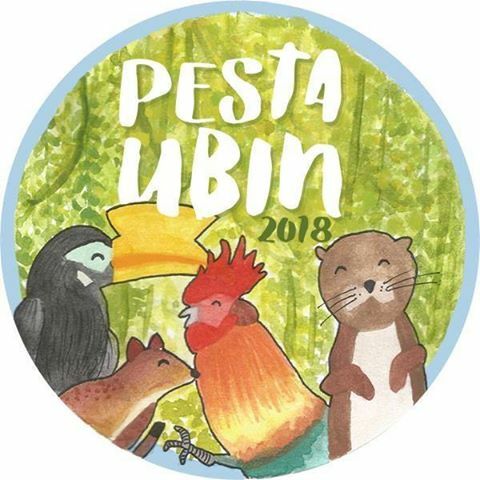 Our thanks go out to National Heritage Board for their support, National Archives of Singapore for their continuing collaboration with the Pasir Panjang Guides and our wonderful participants who make our efforts all worthwhile! 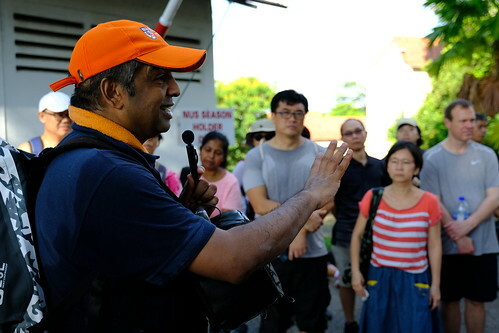 The Pasir Panjang Heritage Guides – old and new – have started training, in preparation for next year’s walks. 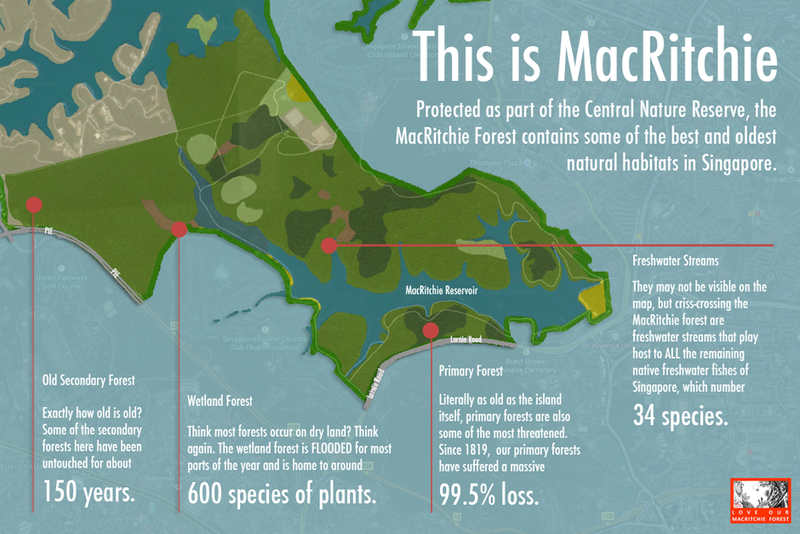 First up, as Kiah Shen shows, was a refresher about the plants on Kent Ridge. We gathered on a cloudy Saturday afternoon for our session with Siva and Cheng Puay. The lesson plan was simultaneously impressive and daunting, especially for those who lacked a firm grounding in Biology. common descriptive terms – shrub, tree, herb etc. 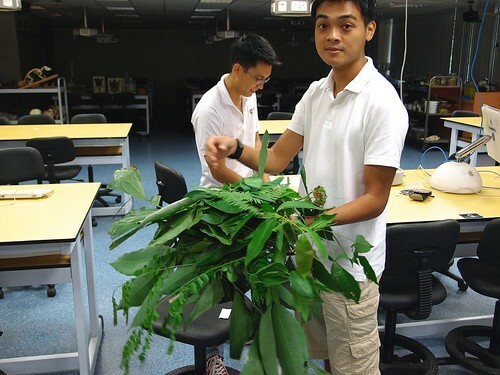 Cheng Puay, our Botany expert, kicked off the session with a quick introduction to the world of fauna. We were then assigned various plants to study. 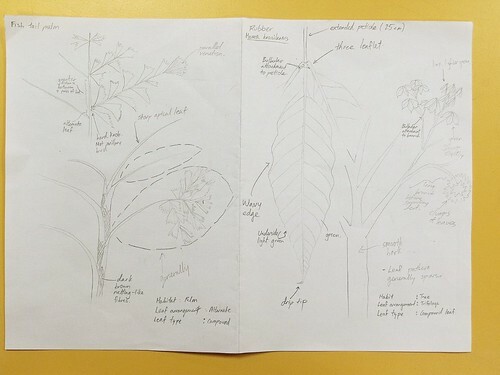 Each of us had to do a sketch on the spot with detailed descriptions, then bring back the respective plants for more detailed botanical drawings. 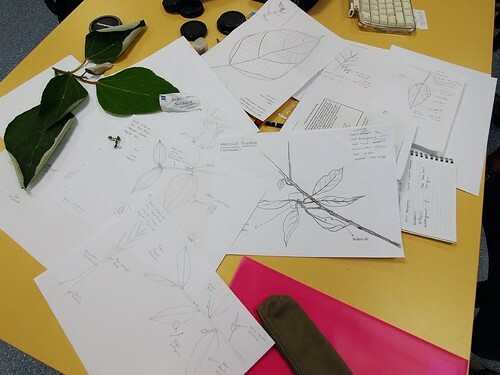 This is the first time some of the guides have had to examine plants in minute detail! Some had impressive annotated nature notebook drawings. 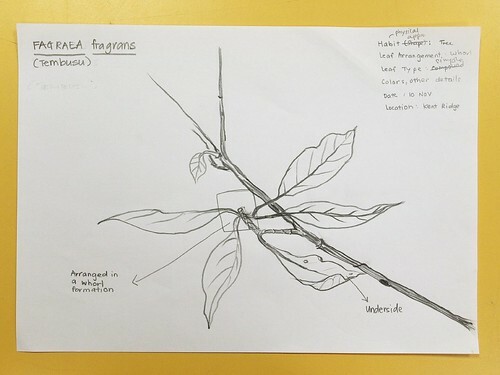 Others showed their artistic ability with detailed botanical drawings. And all of us had an enjoyable time learning about these plants of Pasir Panjang.